Contact us at (704) 708-9663 to learn more about our dog grooming services. All prices listed are estimates. Your final grooming price will be based on coat condition/length and services provided. Your dog doesn't have to be playing at Camp to get pampered. We can make grooming reservations for dogs that are not enrolled at Camp. Our Camp vaccination requirements apply to ALL dogs at Camp, including grooming only dogs. Massage bath, hand blow dry and brush out, ear cleaning, nail trim. Add Day Care services to your S'Paw Day Package for only $15 more! All prices listed are estimates. Your final grooming price will be based on coat condition/length and services provided. Your dog doesn't have to be playing at Camp to get pampered. We can make grooming reservations for dogs that are not enrolled at Camp. Our Camp vaccination requirements apply to ALL dogs at Camp, including grooming only dogs. Your dog doesn't have to be playing at Camp to get pampered. We can make grooming reservations for dogs that are not enrolled at Camp. 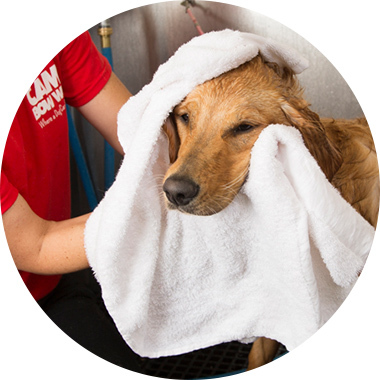 Our Camp vaccination requirements apply to ALL dogs at Camp, including grooming only dogs.